but the screen is completely blank (not black, off). say it works, and the vesa driver works in some extents. BoardName   "Radeon Mobility X700 (PCIE)"
I'll attach the full server log in a comment. The Acer Ferrari 4005 has too many outputs and confuses the screen detection. the ATI driver section in your xorg.conf set MonitorLayout to "LVDS, NONE". read before posting here, and that would have set me on the track? able to detect monitor because DDC2 (i2c) probing fails. panel which would otherwise assign MT_LCD to non-DDC DFP/LCD. probing successfully detects primary head as LCD. info from BIOS are often broken. applies to LCD on Ferrari 4000, it applies to CRT monitor on Sony Z1WA. workaround the confusion in dual head systems. reason DDC2 does not succeed may be no monitor is connected. most likely the probing info should apply to the other head. could't be CRT since the probed info applies to the second head. at a mode that is the largest common mode between two monitors. mode even without CRT connected. addressed in a separate bug. manual hsync and vsync modes in my xorg.conf. Won't this break when VBE isn't available? > Won't this break when VBE isn't available? it didn't break anything for me atleast. Okay, I thought it called VBE functions unconditionally, but I mislooked. unrelated RN50 specific max_pll_freq change in there. (1) Start X server without a config file, with or without CRT connected. * Without CRT, you will get a native LCD resolution 1680x1050. lower than LCD's native resolution. will turn on display of the CRT monitor. otherwise power DAC down again. (1) On what system did you test both patches ? (2) What did you see when applying the second path ? (3) Please also send both log files when applying these patches. found at the bottom of the log. I also think this bug _might_ be related in some ways to bug #8038 in some way. > found at the bottom of the log. What did you actually specify for Monitor2's type ? It is weired that the same probing data is generated for port 1 and port 2. The 'older' patch seems to work (I get a 1920x1200 image on my laptop LCD). This is the Xorg.0.log for a 'working' run with that patch. It's still suffering from bug #8038 though. > (1) On what system did you test both patches ? A Dell latitude C640 using a radeon mobility 7500 32 MB card. > (2) What did you see when applying the second path ? Nothing, X crashes and drops a stack dump. > (3) Please also send both log files when applying these patches. current git (with newer patch already applied) non working log. This looks mostly to be caused by bad BIOS parsing code from ATI..
default setting is used for both ports when DDCType is detected 0 on port 0. DDCType, DDC2 probing fails but VBE probing succeeds for the LCD monitor. On port 1, defaut setting sets DDC_VGA to DDCType, DDC2 probing succeeds. not happen either because test on CRT connection fails. VBE probing does not happen because CRT is not connected. set to DDC_MONID, DDC2 probe mistakenly detects it LCD too. case a config file with MonitorLayout option will be required. support DDC2, but support VBE DDC. attempted fix from other bug for ATOM bios parsing..
> attempted fix from other bug for ATOM bios parsing..
makes it extremely difficult to install any distro... has it been fixed for 7.2? I applied Dave's "guesswork 101" patch 7793 to the Ubuntu version xserver-xorg-video-ati 6.6.2-0ubuntu5. It did not help on my X700/laptop, I still have to use the MonitorLayout setting. (duplicates are listed in the left pane, a page or two down from the top, under "Duplicates of this bug"). > "Duplicates of this bug"). Can you try the patch (attachment 7409 [details] [review]) to see if it works. I applied the 7409 patch to git from yesterday, testing on my Acer TravelMate 8100  with X700 Mobility PCI-E. The screen is still black. The patch 7409 would not apply cleanly nor build. I had to replace a bunch of "." member operators to "->" pointers. Here is the final patch that I used. Maybe I should add that, except from the ati driver and libdrm2 2.3.0-1 and kernel 2.6.20-6-generic I use the plain Ubuntu 6.10 setup with xorg 7.1. Compared to the original 6.6.2-0ubuntu4, or my recompiled 6.6.3-2 from debian, yesterday's git version has some weirdness (with or without the patch): At start or stop or console-switching it goes black for around 15 seconds. I tried applying Dave's "guesswork" 7793 patch in addition to Henry's patch 7409. This is why you had to revamp it to make it work. Thank you for the effort. (with very minior changes). Please try it (alone) and let me know. Holy cow, it works! Thank you so much! Would it be possible to apply this fix to the stable 6.6.3 release (for Xorg 7.2)? To fix the problem we need to fix the ATOM bios parsing..
On the Ubuntu side of things (see the links a bit above), the workaround patch was applied on top of 6.6.3 in the development version. It seems to work for many, but so far it also seems at least two people are now having problems after the patch. The problem was a huge one (19 duplicates), so I guess at some point it has to be evaluated whether there are enough new problems to have the patch reverted, or if the patch really fixed _so_ many computers that those new ones can be (sadly) ignored until a real solution is found. In the last 2-3 comments, there is currently mentioned one HP nw8240 FireGL V5000 user (not the later comment where someone else had tested an older daily CD) with a new blank screen problem, and one (no details) X700 user that already had a screen corruption problem when going to a console, but also now wrong resolution and offset after the update. Considering the patch was already named to be a hack, this is of course not that surprising, but just FYI. > ones can be (sadly) ignored until a real solution is found. > wrong resolution and offset after the update. > that surprising, but just FYI. Can you send more info on the new problems after the patch. > Can you send more info on the new problems after the patch. A big majority has given success reports, ie. the patch has fixed their issues, but there are two expections. https://bugs.launchpad.net/ubuntu/+source/xserver-xorg-video-ati/+bug/90571 - this one has a blank screen on HP nw8240 with ATI FireGL V5000 PCIE after the update unless manually specifying monitor refresh rates. The other one is reporting that the update created a wrong resolution/offset situation: http://librarian.launchpad.net/6710130/ati-X700-lastupgrade.jpg. That's all the information at the moment. > > Can you send more info on the new problems after the patch. > but there are two expections. > update unless manually specifying monitor refresh rates. probably using patch 8651. Please try the later version 8746. > information at the moment. Where can I find a log file for above problem ? > probably using patch 8651. Please try the later version 8746. Well, it's not 8651 and it's not 8746 either. The actual patch that went in is this: http://librarian.launchpad.net/6456764/13_fdo_att7409_bug5473.diff, and I'm now trying to ask the author if it really was based on 7409 like it's named (with which he earlier said he still had blank screen, but claims that this patch at launchpad is such that it works for him). Are you able to say if it's clearly "just" 7409/8651 with additional modifications, or if it is a 8746 modified for the 6.6.3 driver, or something in-between? It adds extra complexity that it has to be backported. > Where can I find a log file for above problem ? Unfortunately the user has not given logs, only comment in the https://bugs.launchpad.net/ubuntu/+source/xserver-xorg-video-ati/+bug/22985 which is the long, long bug that has all the duplicates related to this problem. Near the end there is this attachment "wrong offset/resolution", and also after that there are a few success reports from people that the current patch already helped. Timo, when I had said once that 7409 didn't help, it was because I had tried to apply it (or my not-so-perfectly revamped 8651) to current git at that time (that would rather need the cleanly revamped 8746). 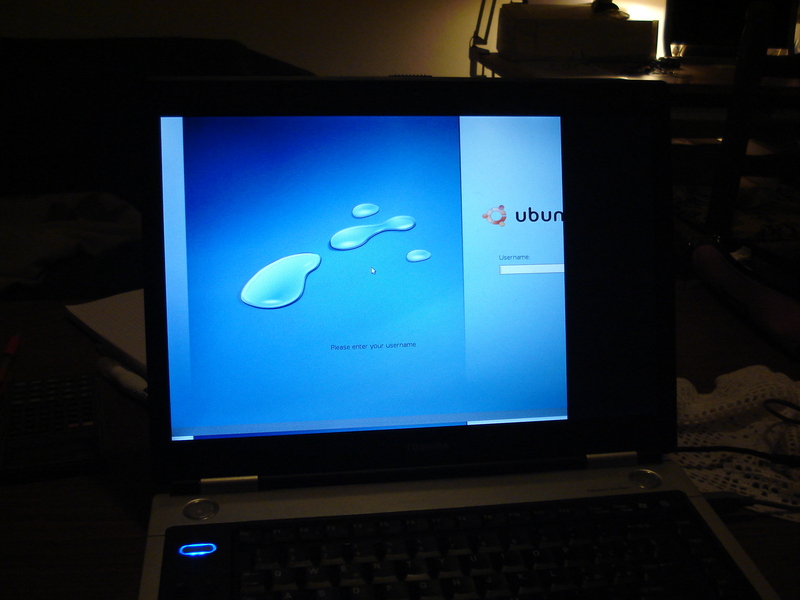 Later I tried to apply 7409 to Ubuntu Edgy (ati 6.6.2) and here it worked, with "cosmetic" adjustments to the patch. Henry, I don't think Luka was using 8651, because it never made it to a published Ubuntu package. He most probably used 1:6.6.3-2ubuntu3 which includes the adjusted 7409. What's the status of this bug? We have similar bug reports against xf86-video-ati-6.6.3 also. (II) RADEON(0): VESA VBE DDC transfer in appr. 1 sec. Can this be related to the patch, or is it a completely separate issue? With 6.6.193 I still need the patch from attachment 8746 [details] [review] to get my X700 working. Without the patch, the screen stays black even when I switch to a console. For 6.7.191, this patch does not apply, and the server does not even start. I tried adding the "MonitorLayout" option to the "Device" section, but it did not help. try ati git master. no patches. I took xserver-xorg-video-ati 6.7.191-1ubuntu1, applied the "Always assume LVDS is connected" patch to it, and ran it with xserver-xorg-core 1.3.0.0.dfsg-6ubuntu3feisty1. Works fine! Thanks! this should be resolved in ati git master and driver releases 6.7.192 and up. now I use Xorg 7.3 and the bug is still there. After adding Option "MonitorLayout" "LVDS,AUTO" do the Device section of xorg.conf and a x-server reboot, it works. XBOARDNAME="ATI Technologies Inc Radeon Mobility X700 (PCIE)"